I've read a lot about Bliss Kiss Pure Oil and finally decided to try it out for myself. Here is some info about Bliss Kiss and what helped me decide to try it out. I was not looking forward to three days without polish. I was pretty concerned about breaking my nails since they were going to be so vulnerable without polish, so I filed them shorter. I have used NailTek II for so many years I can't remember not using it. I know that any time I stop using it I get peeling. Also, I think my nails are more brittle because of the NailTek II but I'm convinved it DOES help me them grow longer. 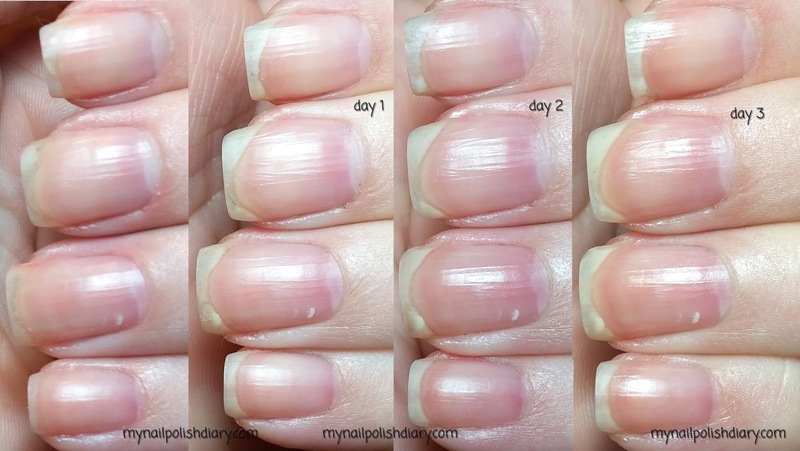 I've been studying about this type of nail strengthening and the fact that your nails actually break easier. They also contain formaldehyde. Which isn't good for me. This is the reason I started looking for an alternate way to strengthen. I followed the 3 day hydration treatment instructions and applied every time the oil absorbed and after water. I had a deep/big spot of peeling on my index nail (top of picture). My middle finger had a pretty good hangnail/cuticle issue. This plagues me. I don't know why it's such a weird finger but I can't vote it off the island. I need it! After just one day I could already see a difference in the free edge of my nails. The index nail peel is beginning to repair. They are whiter, which I think means the layers are already bonding together and getting stronger. By day two I am sincerely impressed. My nails look good! The peel in the index finger is almost healed and the middle finger cuticle looks pretty dang good! Day three I am convinced I will have Bliss Kiss Oil in my life for as long as it's available. The peel is gone. My cuticles are pretty much perfect. The free edge is white and my middle nail looks less uneven. It's still not perfect, may never be, but the skin under the nail is less tight and doesn't come all the way to the edge. The more I use the oil the better my nails and cuticles look and feel. I have continued applying it several times a day and over my polish. I want to mention the pen that came with my starter kit. I love this pen. It reminds me of a lip gloss pen with the bristles and the clicking part to add more oil. It's the perfect applicator! I adore it. I'll be ordering more so I can have one in my purse and in other places in my home. Bliss Kiss Pure Oil is available on their website here and on Amazon. I would easily recommend it to anyone interested in strengthening their nails and improving nail growth and cuticle health.